Description of "Unorthodox Leadership & Animalism"
This book is a simply worded collection of experiences with the purpose of leaders across functions - mainly the corporate - understanding the fact that sometimes, it is necessary to look beyond the rule book for answers. It is vital to be creative, and this book shares experiences that have been called creative at the time of implementation. The basic creativity displayed by any leader has been shown with strong references to animal behavior in different situations. Amit D’Souza is a management professional with a decade and a half of corporate experience. He has worked in various roles and industries and has varied interests. Through this book, the author wishes to let his readers know that being different, going beyond the text book is not bad – as long as you know in your heart that it is right. He is based in Bengaluru, and loves to travel. Growing up on a farm, one of his earliest passions has been observing animals and birds. As a leader, Amit has had the opportunity to work with the best in the industry. This book is a summary of the experiences and time shared with all of them. Reviews of "Unorthodox Leadership & Animalism"
Great job Amit for your excellent publication. The book has been a pleasant read. I specifically liked all the examples, excerpts, analogies to real life events and people. Looking at leadership concepts and how they relate to animals is a refreshing change from the other several books in the market on management concepts. Having been in the same industry as the author also helped relate to some of the scenarios presented in the book. Great job again Amit. Keep up the great work. I look forward to your next bestseller. Amit D’Souza’s first book is a great effort. He is on familiar territory, writes from his observations and experiences and provides the occasional insight into his own thought process. For example he questions the very concept of Best Practice, a concept organizations follow to the ‘t’. You may not agree with him, but cannot question his right and logic to disagree either. He picks up everyday matters, puts them in perspective, gives examples and makes it a very easy to read book. Relating leadership qualities to animal behaviour is indeed an interesting idea. Thankfully, it is not an extensive discourse. It is of a handy size, with a large print (important for people like me), written very simply,and certainly worth a read. Read this book and found it very useful. A good light and informative read. Especially for me who can connect to some specific examples mentioned in the book. It is nice to see your leadership style being mapped to an animal which Amit has done well throughout his book. The tone and language used in the book also makes it a delightful read after a hard day’s work as a leader. Keep up the good work Amit and al the best for your future works. Very well written... The book is a light read without any definitions and theories of leadership. It covers various important aspects of leadership in a unique way that makes it easy to implement the learning. Thoughts are channelised in the form of small chapters that talk about a concept drawing base from the author's rich management experience, followed by some citations by the industry leaders and summarising it with some of the most common observations from the animal kingdom. One can identify so easily with the references. The language is fairly simple and straight forward with a conscious effort to avoid jargons. Looking forward to more literature from this author. One of the most attention-grabbing management books i have read so far. From the smart maneuver’s on day to day managing for leaders to the thought provoking unorthodox practices, Amit has put across his thoughts and experiences in a very relevant manner, aptly applicable to the current corporate culture and of course, with a unique concept of animal references. It is the perfect antidote to the otherwise commonly seen management books on innovation and inspiration. Kudos! An interesting read. Most of the instances described here are quite relatable, and some experiences to learn from. Many people prefer to resign to a leadership where they stick to the text book methods - this book shows why that may not always be the best course of action. At the end of each chapter, each leadership trait is matched up with a relatable animal characteristic. This, the usage of quotes from various leaders that the author has worked with, the simple language used in the book are just some of the things that keep you engrossed. I have known Amit D’souza for nearly a decade we have been colleagues and good friends too, in his book “Unorthodox Leadership & Animalism” I was impressed to learn how he has gather the data / knowledge, experience from his association with various Leader that he has worked with. Amit has narrated his experience with a charm, continuity and specially the way he was able to identify the Leadership quality their work and associated them with Animal instinct or rather the instinct was there Amit had to search for Animal to get it fit for the Leadership Characteristic. The leadership characteristic and the example that were given are authentic, easy to comprehend and useable in any given circumstance. I really like the Chapters on Sudipto Mukherji, Joseph Chako and Abhinash Rath the thought process and the way they executed their work and willingness to get the work done by their team, the way they got their team prepared and become result oriented is nicely documented. This book seems to more of Service Desk oriented. But the learning from this book can be used in any field as Leaders can emerge and be successful in any strata of the society. To summarize, this book is for the beginners and for experience leaders as well. 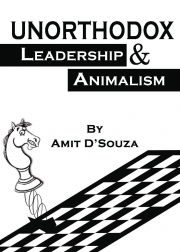 Unorthodox Leadership & Animalism by Amit D'souza is probably one of the unique books that I have read. The USP of this book is the animal references in the book. It is very commendable of the author to have thought of the characteristics of animals and used it as instances to support the leadership solutions mentioned in the book. The book is a collection of the author's experiences as a team player/leader and the unorthodox practices that he and the leaders he worked with have followed. At the end of each chapter, there is a quote of leaders the author has worked with, and my favorite, the animal behavior. The language in the book is conversational which makes it very easy to understand. A simple and an effective book that every leader or a leader-to-be should read.